There are two kinds of citrus juicers available for you to choose from. To make the right decision you must be able to have a clear assessment of your needs. The manual juicers have been around for a while and it was able to provide the necessary juicing capabilities that consumers wanted and needed. But today the needs have changed the lifestyle of the people who uses a juicer also evolved. The challenge is two way. The juicers themselves have to be better at juicing, and the people buying them must decide best if the juicer they will buy would be able t hold out to their expectations. 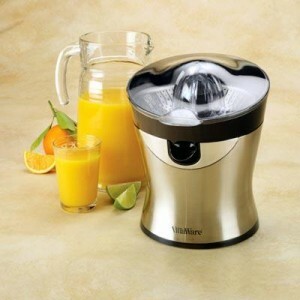 There is no single best citrus juicer, only a prefect juicer for your use. There are many kinds of electric powered citrus juicers. All have their own strengths and weaknesses. The first one is called the centrifugal juicer. True to its name it has blades that can toss around the citrus fruit inside it and create a centrifugal motion that is enough to extract the juice. This juicer needs to have the fruit peeled first before you can juice it. The other juicers are the masticating juicer and the triturating juicer. The main advantage of these juicers is being able to make total citrus juice that can be of better quality than what a centrifugal juicer can make. The main difference is the inclusion of other edible part of the citrus fruit to the juice processing. More than just citrus water (what the manual juicer can make) the masticating and triturating juicer allows pulp to go through. Although by preference many people would leave out the pulp, having it in the juice makes it more nutritious. The juice through this process can also be less sweet but the live enzymes and other healthy substances will be able to make it to your every glass serving.